PianoArc captures the camera at the Superbowl Halftime Show. Sweet! Brockett at the Superbowl on the PianoArc. 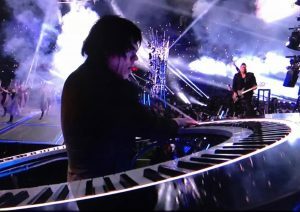 That was Brockett Parsons, playing his Brock360 circular keyboard on the stage with Lady Gaga at the Superbowl Half-Time show. Way to go Brockett! Join us on Twitter to spread the love and the news! Very exciting moment for PianoArc! While we knew the keyboard was heading to Houston, we didn’t know if the camera would actually find it – but there were some great closeups. Sorry, but I think our website crashed for a bit! We want to hear from you – so stay in touch with us via our Contact form!